stories from my red thread life Reflecting on a tragedy in Bangladesh: Is it possible to shop with a clear conscience? Reflecting on a tragedy in Bangladesh: Is it possible to shop with a clear conscience? On April 24, we all heard about a factory building collapsing in Bangladesh. Dozens of people were declared dead, and it was horrifying to hear about this tragedy unfolding from afar. Photos of the scene showed a garment labelled Joe Fresh, and Canadian consumers suddenly felt they had played a part in this tragic event. Now twelve days later, the death toll tops 600. Terrible grief has come to countless people in Bangladesh, and journalists around the world have grappled with the questions raised – some searching for solutions, others laying blame. Many shoppers have been questioning their role. Major retail players whose clothing was known to have been made in the building, namely Joe Fresh in Canada and Primark in the U.K. (with overlapping corporate ownership), have announced plans to compensate the victims and to change the way they work in Bangladesh. In this they were recently joined by a few other clothing retailers whose garments were also found in the rubble. Would they be doing so if their connection to the building had not been exposed? We have no way of knowing. What next? The scale of this tragedy is enormous – I hope it will turn out to be a defining moment that changes the way we all think about where our clothing is made, and under what conditions. The Facebook page for Joe Fresh is packed with comments expressing outrage at the company’s abuses, and vowing to shop elsewhere. But where? I am a huge advocate for buying local, but I know that Canadians cannot live on Canadian-made products alone. Our manufacturing sector is simply too small. Trade barriers are one challenge: Canadian manufacturers pay high duties on raw materials (such as cotton, which needs to be imported), while clothing made in Bangladesh arrives in Canada duty-free. And as we all know, vast wage differences have changed the geography of manufacturing, with clothing production often relegated to the poorest countries. We don’t want people to be harmed making products for us, but we don’t want to pay dramatically higher prices. What is a conscientious consumer to do? If you are concerned about the people making products for you being treated with respect and human dignity, you may wish to support an organization that’s committed to improving labour conditions overseas, or petition for stronger regulation of imports to Canada. You may choose to pay closer attention to where the products you buy come from. Many companies describe their policies on their websites, and some only use certified factories. But be aware that unless there is direct oversight in the producing country (not just occasional inspection visits), there is a great deal of subcontracting — and standards are difficult to control. Boycotting a company that has not adhered to decent labour standards will send a message, but be aware that others may be worse offenders. And if a garment is dirt cheap, you can be reasonably certain that that the person who made it is dirt poor. If this matters to you, pay closer attention to your buying habits. The cheapest, most exploited labour is often used for the cheapest garments. A higher quality garment will last longer and may save you money and effort in the long run, regardless of where it is made. If you want to buy Canadian, there are a lot of excellent Canadian-made products available if you know where to look. 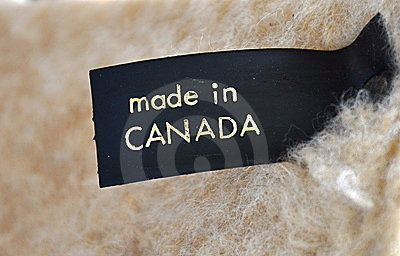 Websites such as www.buycanadianfirst.ca, www.livinglocal.ca, and www.farmersmarketonline.ca list thousands of products that are made in Canada. Retail craft shows such as the One of a Kind Show and smaller shows across Canada showcase Canadian-made products (both functional and decorative) and list them on their websites. And some independently-owned stores across Canada search for Canadian-made goods for their customers. If you want more local products, let your local retail businesses know, so that you can influence their buying decisions. Have the garment factory tragedies in Bangladesh, and the recent discussions about worker safety and exploitation encouraged you to change your shopping habits? Do you feel empowered to influence the way our clothing is made, or overwhelmed? I’d love to know how this rising awareness has affected your decision-making, as well as the strategies you employ to shop with a clear conscience.